You’ve probably noticed that I’m kind of messy. For example… when I set up to photograph goodies for you to want to make and eat, some people have this amazing gift with elaborate tablescapes, pretty napkins, and perfectly placed utensils. I, on the other hand, am usually not satisfied until I have “decorated” the scene in front of me with an explosion of ingredients and a big giant mess. So on a perfect 83° day, you know I had to share a big, melty, perfectly chocolatey, peanut-buttery mess with you. I learned how to clean it up. I made these Chubby Hubby Sundae Cones and set up this whole little sundae cone bar, complete with Wet-Nap wipes, to tell you all about how you’ll love having them handy when you have sticky-fingered guests, or when your 11-year-old has a smudge of melted chocolate on his cute chub of a cheek, and it is no longer appropriate to lick your thumb and wipe it off. What I realized in the process is that I have no idea how I have gotten this far in my life as a mom, or my mess-making job without these things. But this is serious. When I’m working I always keep a damp cloth nearby because I try very hard not to gum up my expensive camera with frosting and cheese and pizza sauce. Often though, that damp cloth smells like onion or garlic or something because I just used it to wipe down my cutting board or wash a dish. And then my fingers smell like a combo of sticky dessert and old garlic funk. Ew. These little Wet-Nap singles totally solved that problem. 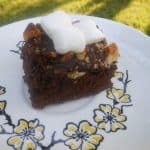 Probably most of you do not have a food blog though, and you actually eat your food rather than playing with it on a table situated on your front porch. I get it. So I’ll tell you where else I stashed these: My purse. My glove box (does anyone else keep a stash of drive-thru napkins in the glove box? I have since my boys were small, but these are 1000 times better than that). The kitchen. Chad’s gym bag (yes.). The basket on the table where I made these cones into sundaes. And no more sticky fingers. 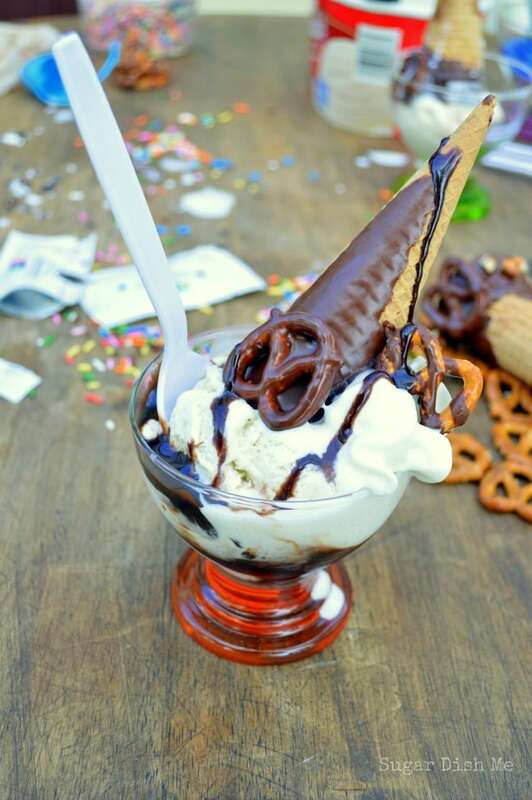 Setting up a Sundae Cone Bar is easy. 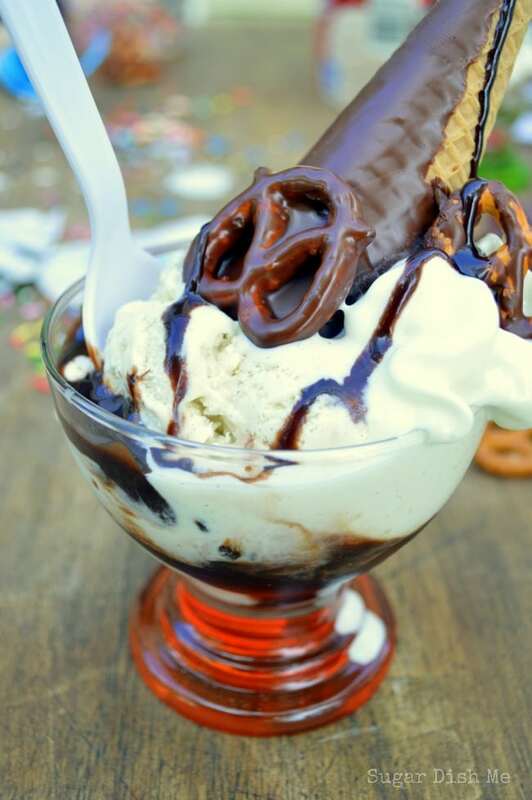 You need ice cream (duh), chocolate sauce, whipped cream, pretzels, SPRINKLES, cute dishes that you found on clearance, spoons, Wet-Nap Packettes, and these Chubby Hubby Sundae Cones that will really make your life complete. No, really. 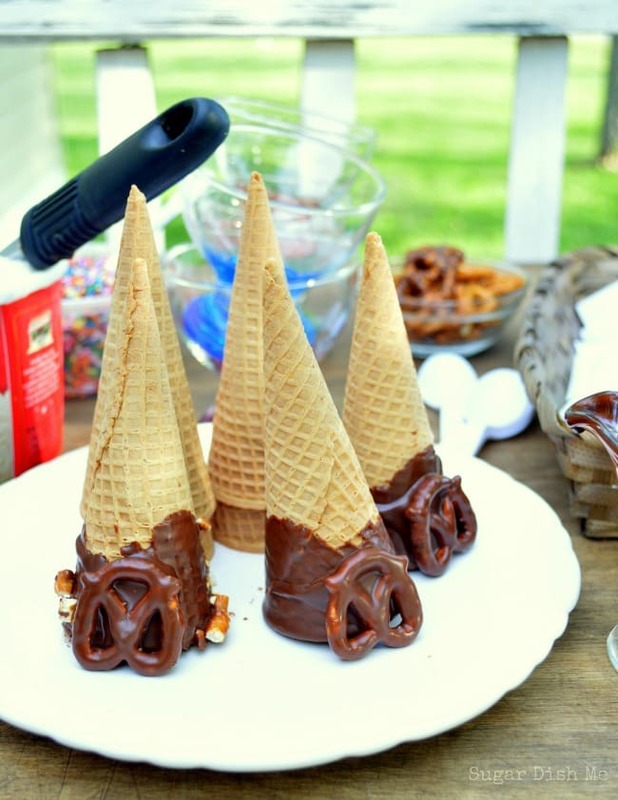 Sugar cones dipped in a chocolate peanut butter shell and then fixed with dipped pretzels. 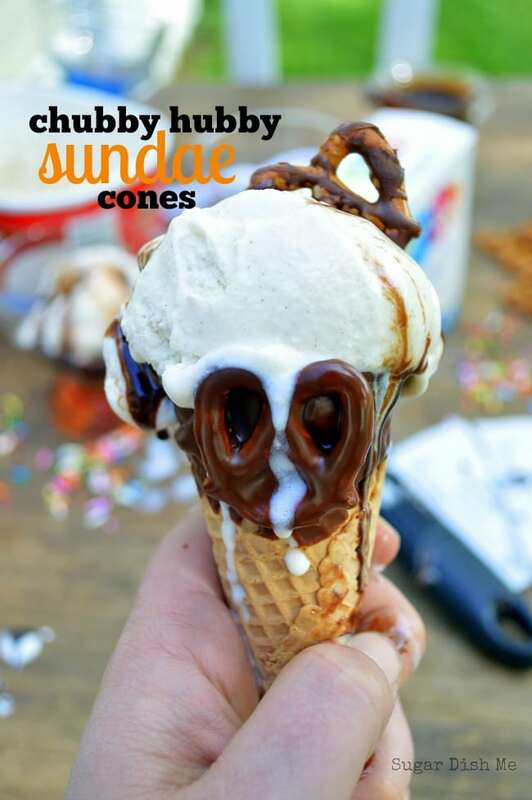 Filled with ice cream, topped with chocolate syrup, more pretzels and whipped cream, these sundae cones are a delicious, EASY, FAST, summer ice cream treat! Laying out a sheet of parchment or wax paper to place the dipped cones and pretzels on will be helpful! Melt the shortening in a small saucepan. Add the chocolate, stir once, and remove from the heat. Continue stirring until the chocolate is smooth. Then add the peanut butter. Stir until it's smooth. If your mixture is too cool to start with you may have trouble getting the peanut butter to melt completely. If that happens, return the saucepan to the stove on VERY LOW HEAT (no burned chocolate!!) and stir until the mixture is smooth. Tip the pan sideways so the chocolate/peanut butter pools to one side. Dip the cones, swirling each to let the chocolate come about ⅓ of the way down, both outside and inside. Set them aside to cool. Drop 6 of the pretzels in the chocolate/peanut butter to coat. Lift out with a fork, gently shake the drips off, and set them aside to cool. Lay out the last 6 pretzels and drizzle with the chocolate/peanut butter. Let cool. To fix the covered pretzels to the cone, spoon a little onto the side of the cone near the lip. Place a pretzel on top of the chocolate, spoon on a dab more, and let them set up (sometimes I use the freezer so they set up faster). Quality chocolate will melt easier. Baking chips will also melt much easier than chocolate chips (chocolate chips have stabilizers in them). 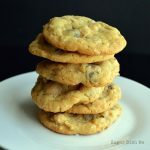 If you HAVE to use chocolate chips, you will have to stir longer and be more wary of the heat. If you’d like to try the Wet-Nap products shown here, you can grab this coupon, good for 55 cents off regular price HERE. I found mine at Walmart where the everyday price was already low! The more drippy and messy and melty the treat, the better! I’m all for it. And I love these sundae cones! Such a cute idea. Oh, and how clever to have the Wet Naps handy for recipe photo shoot messes! You delivered once again! These look awesome for a perfect 83 degree day. I love sugar cones…these look extra good! I can see why the wet naps come in handy! 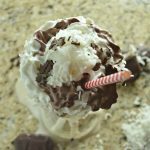 Love all of that chocolate drizzle! omg, I love this! 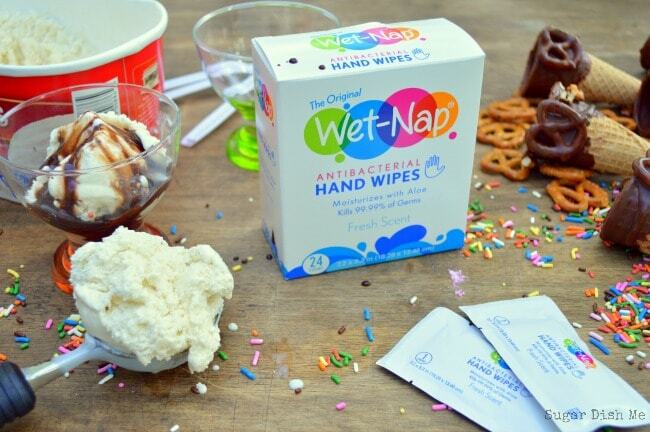 now I’m craving ice cream and wet naps….which are a must have for ribs too! Want!!! This looks SO good, Heather! I would eat one off the screen if I could then use a wipe to clean up the screen! 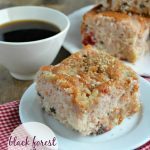 Fun post Heather! I love this, it makes me feel at home! This is totally my life, and I DO have smudges and crusty food all over my camera! I need some of them wipes! This Chubby Hubby Sundae is the best!! I need extra chocolatey pretzels! Ahahahhaa So glad I’m not alone with my crusty camera. Thanks Tanya! Thank you Claire! Pretzels and sugar cones should always go together. Your husband sounds like a smart man. Hahaha, I never go anywhere without them in my purse! I can’t stand anything sticky on my hands,and I love barbecue sauce. 😉 I’m glad to see that I am not the only that makes a huge mess!! Yeahhhh BBQ sauce! Messy friends unite. Thanks Lisa! Girl, I am never caught anywhere without wet naps in my purse. With a 2 year old, a messy husband and a messy me we would look like a hot mess out in public if I didn’t have that stuff in my purse. 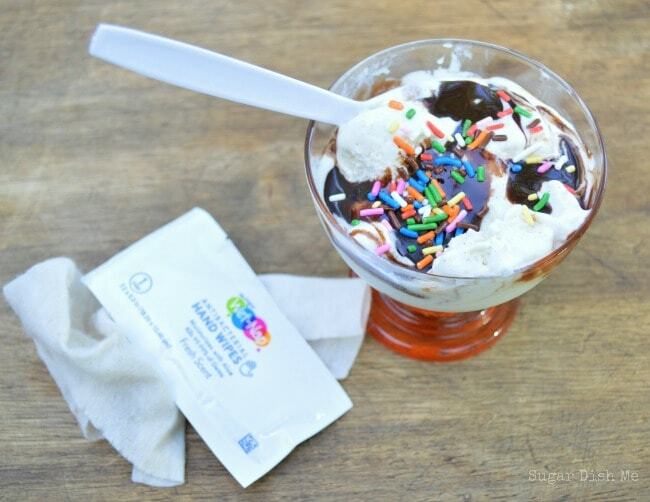 Loving this drippy ice cream… its the best way to eat it and totally all over that to die for recipe.. yum! Ben & Jerry’s makes the best flavors! Yum!! This looks delicious!! And I totally agree about the need for wet naps!! Must get some soon!! Must must must! How has messy me been food-photographing without them?! Thanks Diane! Thanks Uru! They are so easy to make!! Thanks so much Kelly! And yes! They are so handy! Heather, these cones are just beyond! I love those pretzels on the cones too–so cute! I’m a hot mess when I’m doing pretty much anything (cooking being the worst :). So glad I’m not alone! 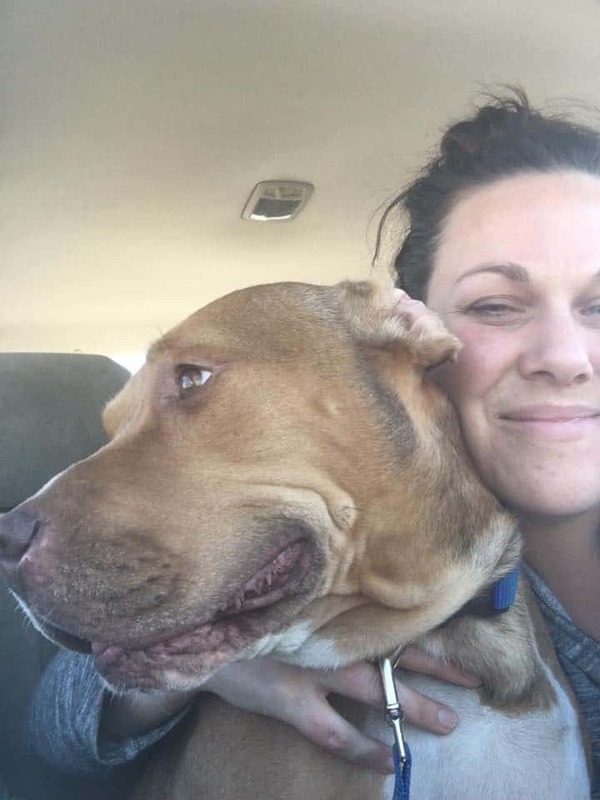 Thank you so much Amy!!! Glad I have a messy friend that can relate!! Mmm I could indulge in a few of these bowls of ice cream!! Pinned! Chubby Hubby cones?! YES PLEASE. I can’t even handle this amazingness right now.